Editor’s note: Kavitha Surana is an intern with Fareed Zakaria GPS. The views expressed are her own. As the protests in the heart of Kiev continue, one thing is clear – a process that began as an overture aimed at drawing a cluster of post-Soviet countries towards greater political and economic integration with the European Union has escalated into a tug of war over Ukraine’s identity. But the refusal so far of Ukraine’s government to sign an association agreement that would have boosted cooperation with the European Union has raised another question – is the region facing a renewed era of Cold War-style confrontations? Certainly, in the lead up to last month’s Eastern Partnership summit, which was supposed to see Armenia, Georgia, Moldova and Ukraine sign up for closer ties, Moscow signaled that it intended to play hardball on the issue. It restricted imports like chocolate and steel from Ukraine and wine from Moldova and Georgia, briefly halted gas flows to energy-dependent Ukraine and hinted that further discomfort would be on the horizon if the agreements went forward. Such opposition is likely in part an emotional response to the protracted disintegration of the Soviet Union’s once far-reaching empire. After all, Ukraine is the country with the closest historical and cultural links to Russia. But Russia’s attachment to Ukraine isn’t just emotional – there are strategic reasons Moscow might be concerned, not least the worry that any deal with the countries on its border risks letting the European Union into its backyard. Putin may have famously blasted “American exceptionalism” in a New York Times op-ed in September, but he has also seemed to cling closely to the idea that Russia represents a unique third way to the East-West model. Perhaps with this in mind, Russia has accelerated plans to establish a Eurasian Customs Union with its neighbors that would facilitate multilateral trade integration. The union would be built upon the foundation of Russia’s current customs union with Kazakhstan and Belarus. But while Armenia – dependent as it is on Moscow economically and for its security – has already indicated that it plans to follow this path, Ukraine still hangs in the balance. The problem facing countries like Armenia, Georgia, Moldova and even Ukraine is that rather than being a partnership between equals, the union would almost certainly be dominated by Moscow and its security interests. Many Ukrainians appear to agree. According to the Wall Street Journal, a poll last month found that 45 percent supported the EU association agreement, while only 14 percent backed the Eurasian Customs Union. Such views have prompted thousands of Ukrainians to take to the streets in protest over the refusal of President Viktor Yanukovych, who has close ties with Moscow, to sign up to the EU-backed deal. A diplomat from the European Union said Thursday that Yanukovych had indicated he intended to sign the deal. Yet whatever happens next, Kim suggests that Ukraine’s government is not the only one that has had a significant stake in the outcome. 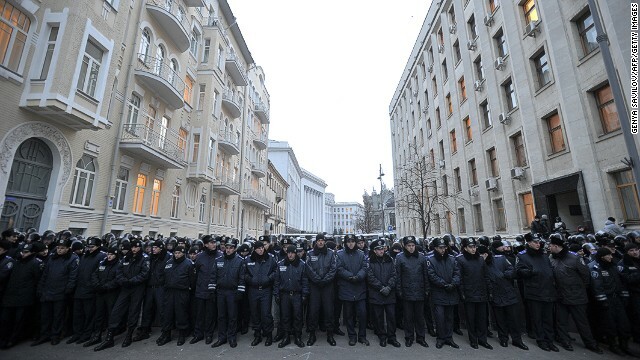 « Previous entryCan Ukraine halt the slide toward authoritarianism?